Alaska Polar Bear Viewing, Fairbanks Polar Bear Viewing Day Tour, Beautfort Sea Polar Bear Watching Tour. 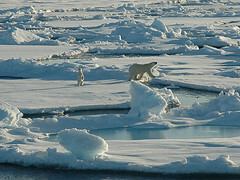 Our Polar Bear Expedition tours leave from Fairbanks during the prime polar bear observation season. In August and September, when local whaling at Eskimo Villages starts, our customers are able to observe polar bears that have traveled to the Beaufort Sea region to feed. The Arctic National Wildlife Refuge notes that the native whaling tradition of leaving unused portions of whale carcasses for the polar bears greatly increases the probability that you will be able to catch sights of bears that have made their way to sites near whaling communities to feed. Local contacts pinpoint the best locations and bear populations, so each trip is different. Advance Reservation Recommended !! 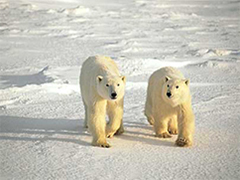 Take a walk on the wild side and see polar bears in their natural habitat before they are gone. Safely view and photograph polar bears, in a rare and special wildlife encounter. Take a walking tour of the whaling village with an Eskimo tour guide. View the bears resting on sand spits and feasting on whale meat. Visit the Inupiat Eskimo village of Kaktovik, which is located along the coast of the Arctic Ocean on Barter Island and is the only village within the Arctic National Wildlife Refuge. The US Fish and Wildlife Service (USFWS), which manages the refuge, is taking steps to ensure that such activities are not disruptive to the bear,s and opportunities can continue for the public to enjoy, observe, and photograph these bears in the wild. Whether viewing polar bears independently or with a guide, it is each individual’s responsibility to ensure that their activities around polar bears are safe and lawful. The Polar Bear is a powerful and patient predator on land, sea, and ice, the polar bear is the world’s largest carnivore and a unique symbol of the Arctic. Hundreds of thousands of years ago, Ursus maritimus, or the sea bear, evolved from its brown bear (Ursus arctos) ancestors to occupy an ecological niche in the frozen far north. Its white coat, made of water repellant hair on top of a dense undercoat, serves as camouflage and acts to reflect sunlight to the bears black skin. Its large paddle-like feet, with their fur covered pads, are well suited for swimming and for dispersing the weight of the bear when hunting on ice for ringed seal and other prey. 8:00 am Depart Fairbanks by air. 10:30 am Arrive Deadhorse. Restroom break while pilot is refueling. 12:00 pm Arrive Kaktovik. Van transfer from plane to Marsh Creek Inn for lunch. 4:00 pm Depart Kaktovik for Fairbanks. 6:00 pm - 7:00 pm. Return to Fairbanks.